There are many people in need of support these days, both emotional and financial. The 3d Annual Feast of St. Martha is a fun way to give back to our community this weekend. Restaurateurs and service veterans Courtney and Chef/Owner Brian C. Luscher of The Grape on Greenville celebrate the 3rd annual Feast of St. Martha, Friday July 27–Sunday, July 29. 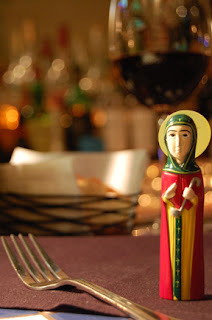 Honoring St. Martha, the patron saint of servers and cooks, Chef Brian will feature a 3-course set menu nightly (in addition to the full a la carte menu) for $38 per person, $55 with wine pairings. $5 from each prix-fixe menu will benefit the Stewpot Alliance which was founded to support The Stewpot in downtown Dallas. The Stewpot prepares and serves three meals a day for more than 700 individuals, 365 days a year at the City of Dallas’ homeless assistance center’s Second Chance Café located inside The Bridge. “This is our way of honoring the tremendous number of volunteers in the kitchen cooking and serving nutritious meals for clients of The Bridge,” says Chef Brian. Reservations are recommended. Located at 2808 Greenville Avenue, The Grape is open for dinner nightly at 5:30pm and Sunday Brunch. For reservations call 214-828-1981 or visit the website at www.thegraperestaurant.com. Complimentary valet parking always provided.